The City of Goshen officially formed its first fire department on December 4, 1862 in response to several devastating fires that occurred in the fall of 1862. The newly formed fire company was called the Reliance German Fire Company #1 and was an all volunteer company. Prior to that, all firefighting efforts were limited to the bucket brigade, where any able bodied man would respond to the call of "fire!" and help pass the buckets of water to pour on the flames. With the formation of the new fire company, an improvement in firefighting technology came as well. The original fifty (50) members donated $1200.00 of their own money, then raised an additional $400.00 through subscriptions in order to purchase Goshen's first piece of firefighting equipment, a hand pump that cost $900.00, along with two hose carts and hose. On May 4, 1868, a rescue hook and ladder company was organized, and two years later, a seventeen (17) member Reliance Hose Company was formed July 2, 1870. It was during this era that Goshen suffered its first line of duty death. On January 16, 1872, firefighter John Martin sustained fatal injuries during a fire that destroyed three buildings on Main Street across from the county courthouse. Firefighter Martin and several other men were attempting to remove a safe from one of the businesses when it fell on Martin, crushing him. Two men were able to lift the safe just enough while a third person pulled him free. Unfortunately, several hours later, firefighter Martin succumbed to his injuries. The Gamewell fire alarm system was put into use in the early 1880's. 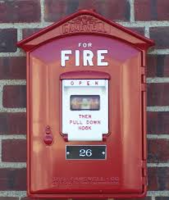 This system was distributed throughout the city for the citizens to contact the fire department. This system remained in place until February 1, 1994 when the duties of the municipal alarm system, (or box alarm system) were relinquished to outside alarm contractors under control of the county government. The City of Goshen had grown to four (4) hose companies by 1905. This led to discussion on the need for a Central station along with city owned teams of horses. Prior to this, the fire department would get their horses from the livery barn. Sometimes the livery would not have enough horses available to bring all the equipment. The city entered into a 5 year agreement with Harry A. Butterfield to lease a barn he owned on West Clinton Street and purchased two (2) teams of horses. Renovations to the barn were completed and Central station was opened on August 24, 1906. Additionally, four (4) men; Chief John Snobarger, Arthur Welty, William Wilkinson and Ed Titmore, were hired as Goshen's first full time paid firefighters. Their first fire run from the new station occurred September 14, 1906. During 1911, the horse drawn fire department responded to the first automobile fire recorded in Goshen's history. Five (5) years after the car fire, Goshen purchased its first motorized fire truck. The truck consisted of two (2) fifty (50) gallon chemical tanks, hose, and ladders. The truck was built by the Peter Pirsch Co. of Kenosha, Wisconsin, and was received June 17, 1916. A team of horses, with a wagon of hose and ladders, were retained in reserve. They were retired in 1918. By June 1922, the department had enough personnel in order to divide them into a two (2) platoon system of five (5) men each. This type of organization began to phase out the volunteer firefighters in the city of Goshen. The two (2) platoon system existed until 1982. The department then decided to form a three (3) platoon system with thirty four (34) men on three (3) shifts, and two (2) men providing staff functions (Fire Chief and Fire Inspector): a total of 36 members. Another first for the city of Goshen was the addition of its ambulance service. In 1940, Goshen became one of the first cities of its size to provide an ambulance and trained emergency personnel to staff it. 1949 saw the construction and opening of North Side Station (Station #2) on Middlebury Street. It was built to enable firefighters to respond to calls on the north side of town in a timely fashion without being held up by trains passing through town. It remained in service until May 23, 1988, when construction of the Main Street overpass negated the need for two (2) stations in such close proximity. A new Central station was constructed in 1965 at its present location on North Third Street. This was also the year that Goshen signed an agreement to purchase its first Snorkel, a 75 foot unit. It was delivered on March 30, 1967 at a cost of $62,000. College Avenue station (Station #3) opened in November 1972 to better serve the growing expansion in the southern part of the city. It housed Engine 3, and later, Goshen's second ambulance. Central and College Avenue stations served the city well for nearly 24 years when expanding city boundaries revealed the need for yet another new station, this time on the west side of the city. Goshen's newest station, Reliance Memorial Fire Station was opened on October 30, 1996, located on Reliance Road. Along with the new station, nine (9) additional firefighters were hired to staff it. Reliance station became home to the first paramedic engine company in the state of Indiana with the delivery of the new Engine 4. It was placed into service in January 1997. Engine 4 served as a paramedic engine for several years until a third ambulance was placed into front line service and housed at Station 4. July 2002, Goshen received its newest aerial truck, a 102 foot Tower/ladder truck built by Kovatch Mobile Equipment. This replaced the 1967 Snorkel unit which was then retired. Presently there are three (3) stations. Central Station located at 209 N. Third St., College Ave. Station (Station #3) located at 1203 College Ave., and Reliance Memorial Fire Station (Station #4) located at 1728 Reliance Rd.